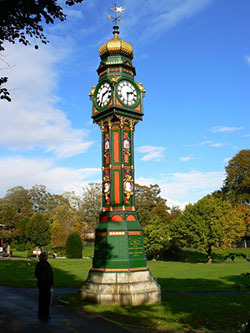 Dorchester is a delightfully typical English market town and has been the county town of Dorset since 1305. The town was founded by the Romans in 43AD. Lovely Georgian buildings off the steep main street, broad Walks, and a busy townscape. Its river is the Frome. A very pleasant place to live and to visit and a good starting place for tours of Dorset. There is plenty of accommodation in the town and in the places around for a very pleasant Dorset holiday. See the top of the right hand column to book, under Useful Information. The Bandstand in Dorchester Borough Council Gardens © Copyright Sarah Smith and licensed for reuse under this Creative Commons Licence. The town has an ancient history with plenty of attractions. Dorchester makes a good base for Thomas Hardy enthusiasts as the writer had strong connections with the town. Market day is Wednesdays. There are lots of shops with the main area for this activity being South Street where there are both local and High Street chain shops. 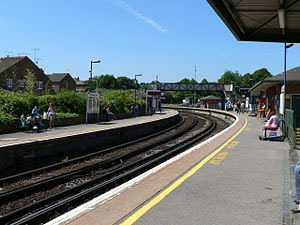 Dorchester South is the station for the London, Waterloo, line. There are plans afoot for Dorchester South. Dorchester West is a smaller station, served by First Great Western, trains from Gloucester and Bristol Temple Meads. A useful connection from Maiden Newton for cyclists who do not wish to do the return cycle ride through the Frome Valley. National Express coaches run between Weymouth and London Victoria, stopping here. There are plenty of local buses in and around the town. There is plenty to see in Dorchester. Whether you are a Thomas Hardy fan, it is shopping you want, museums an ancient hill fort, gardens, a roman villa, a cycling holiday or a pleasant break in Dorset. Poundbury is a new town on the edge of Dorchester can perhaps be described as back to the future! Poundbury Hill is a bronze age hill fort and like all those old hill forts has great views. The area around Dorchester is an ancient in habitation, been around for thousands of years and those folk have left their mark in the landscape. As well as Poundbury Hill, there is Maiden Castle, Maumbury Rings, the Roman Town House and the Aqueduct. These places are well worth a visit. Click that link for an interesting read. There are many famous people connected with the town including Thomas Hardy and more detail of these people are on this page. There is a statue to Thomas Hardy in The Grove and one to William Barnes outside St Peter's Church. Reverend John White MA is buried in the church porch and there is a plaque to him. A fine day and a walk is a good way to see a town. There are several walks and details can be found on a display board near the Town Pump in South Street close to the clock tower and Corn Exchange, or the Tourist Information Office in Antelope Walk. 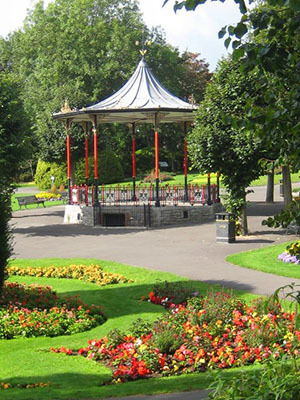 Walk in the attractive Borough gardens amid colourful flower beds. It is an extensive area with a couple of tennis courts and a bowling green plus a large play area for the kiddies. There is a clock tower and a bandstand where live shows take place during the summer. A lovely Gothic building in High Street West has the largest Hardy collection in the world donated by his second wife, Florence. A Mecca for Hardy enthusiasts. Other galleries hold collections of the Roman occupation of the area including artefacts from the Roman Villa, dinosaur footprints, history of the area, archeaological artefacts and geology of Dorset. Old Shire Hall and Crown Court and Cells. Famous for the trial of the Tolpuddle Martyrs transported to Australia in the 1830's. They were convicted of swearing an oath to each other under a law from forty years earlier. The real reason was of course their protest regarding the lowering of agricultural wages for which they had founded their Friendly Society of Agricultural Labourers. They were eventually released, returned to England and some went on to Canada, one died in the workhouse. © Copyright Oast House Archive and licensed for reuse under this Creative Commons Licence. The Museum is situated in an impressive Grade II listed building - a large keep in Bridport Road – a building that just cannot be missed! With their physical and their virtual museums, archives and research this is an extensive and ongoing project. A harmonious empathy of building and collection with a modern outlook on the web. 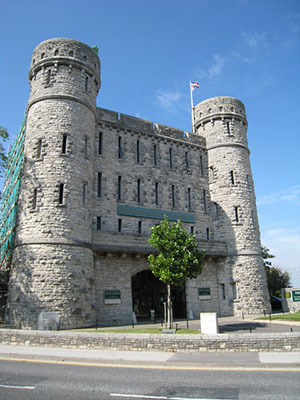 Their collection covers three floors and includes weapons, uniforms, medals and artefacts of The Devonshire Regiment, The Dorset Regiment, The Devonshire and Dorset Regiment, The Dorset Yeomanry, The Queen's Own Dorset Yeomanry, The Dorset Militia, The Royal Devon Yeomanry and 94 Field Regiment Royal Artillery. There is a lift for the disabled and wheelchair access. Go up on to the battlements, the views are incredible. The camera is a must have here. A 35 acre garden open most of the year with the best times around mid May to October. Ornamental Lake, tree and nature trails, small gardens each with their own theme and a walled garden. The animal park has an interesting collection and children can feed some of the animals. Recently they became members of the Rare Breeds Survival Trust. The Palladian style house is not open. It was built in the early eighteenth century for George Pitt who was a cousin of the Prime Minister William Pitt. George Pitt died there in 1734. The original gardens were in the style of Capability Brown but were recreated in the present style between 1915 and 1920 by the Hanbury family. Opened to the public in 1991 and new plantings are put in every year to complement the extensive existing features. The Dorchester County Show, is held in September on the outskirts of the town. Very popular with locals and visitors, presenting a large number of interesting events. The start of the NCN2 the The Sustrans Cycle route starts here in the town. It is an ideal for a stopping off place for a cycling holiday as several pedals into the surrounding countryside start here. It makes an excellent short break too. or you might prefer to browse some more, please do, you will find navigation buttons above on the left.